I met with a group of designers yesterday. We are in the planning stages for "something" in the future that needed a name. Brainstorming is always a very creative exercise; however, we had a number of rules we had to follow. The title had to incorporate the crafts of knitting, machine knitting and crochet - so words, such as "knit" and "purl" were ruled out at the start because they didn't apply to crochet. Also we couldn't use something already in use - This last one was a real challenge because just about every combination of anything has been used on Ravelry!! We did, with much ingenuity, come up with something very inventive - more to come on that, later. 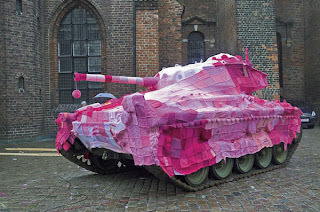 Also yesterday I had a discussion with someone about "yarn bombing." Apparently there is somewhat of a backlash against it. The non-knitting public has taken offence, it seems, to the abuse of things like trees, monuments and architecture by "yarnies" wanting to deface them. I personally enjoy seeing yarn bombing when it is done well. I must admit that I was a little embarrassed by some scraps of knitting wrapped around a few poles near OCAD (Ontario College of Art and Design) when my son was a student there. I say, if you are going to do a yarn bombing don't just use a grenade, use a torpedo!! Today is a "J" day. So my focusing words are journey, joy, and jive. Here also is a catch up from the blog that I have been following. E- Elegant, Elastic & Encouraging, F- Fun, Flirty & Fantabulous, G- Goofy, Gregarius & Galvanizing, H- Hopeful, Holistic & Healing, I- infinite, Innovative & Ingenious! !